The all-new CCM Premier Pro chest protector incorporates design features of the legendary NHL-Favorite Reebok Premier 1 with advanced material technology to create a unit that offers maximum protection while still remaining exceptionally flexible. Beginning in the body, the CCM Premier Pro utilizes high performance D30 foam technology in the sternum. This allows the goalie to have the confidence in net while standing up to even the hardest shots. The lower body section of the unit has been revamped with ergonomically segmented chest blocks to increase mobility and reduce break-in time. Known for its full body wrap style in the Premier 1, the CCM Premier Pro utilizes this design, offering exceptional protection around the ribs and allowing for a tight seal to the body with the arms. The arms have been redesigned with a full wrap around molded bicep and forearm protection to stay square to the shooter. This new arm design features air channels within the foam for increased breathability, resulting in lower body temperatures over long ice sessions. Taking note from the Reebok Premier 1, the elbows are constructed around the JDP (Joint Discharge Principle) design, an injection molded PE elbow cap that stays tight to the arm and snugly in place during play. Lastly, the body of the unit is complimented by a brand new Adjustable Fit System within the shoulder floaters. This Velcro-elastic system allows for precise customization of shoulder floater tension and fit to accommodate every goalie’s preference. Compared to the CCM Premier chest and arm unit, the Premier Pro will offer top quality protection and materials, designed to face advanced level shots in a package that is meant to last. For the goalie looking for the most advanced protection available on the market in a redefined classic design, the all-new CCM Premier Pro is the way to go. 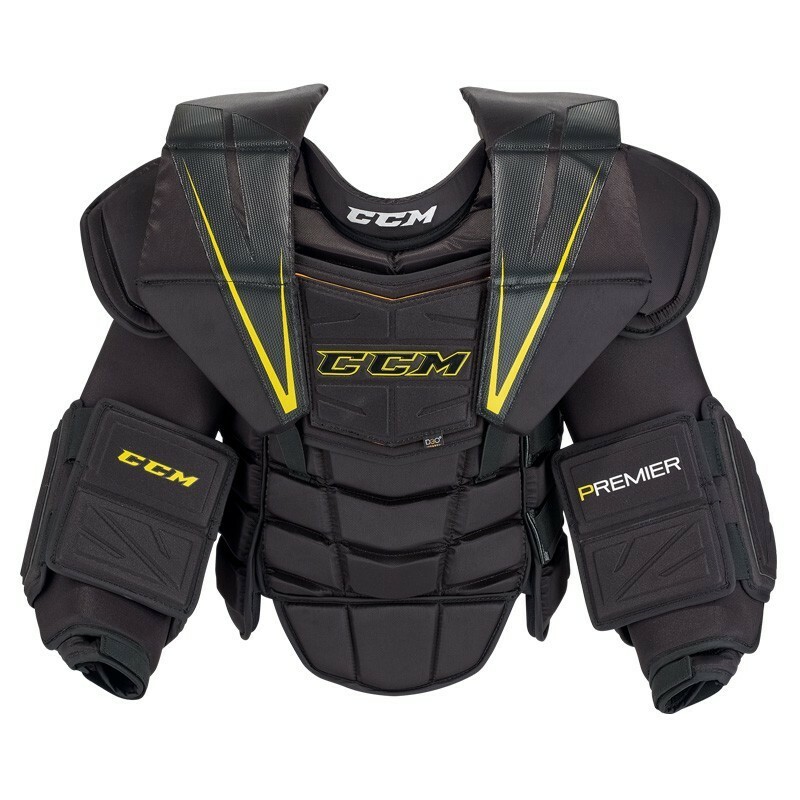 The all-new CCM Premier Pro chest protector incorporates design features of the legendary NHL-Favorite Reebok Premier 1 with advanced material technology to create a unit that offers maximum protection while still remaining exceptionally flexible. Beginning in the body, the CCM Premier Pro utilizes high performance D30 foam technology in the sternum. This allows the goalie to have the confidence in net while standing up to even the hardest shots. The lower body section of the unit has been revamped with ergonomically segmented chest blocks to increase mobility and reduce break-in time. Known for its full body wrap style in the Premier 1, the CCM Premier Pro utilizes this design, offering exceptional protection around the ribs and allowing for a tight seal to the body with the arms. The arms have been redesigned with a full wrap around molded bicep and forearm protection to stay square to the shooter. This new arm design features air channels within the foam for increased breathability, resulting in lower body temperatures over long ice sessions. Taking note from the Reebok Premier 1, the elbows are constructed around the JDP (Joint Discharge Principle) design, an injection molded PE elbow cap that stays tight to the arm and snugly in place during play. Lastly, the body of the unit is complimented by a brand new Adjustable Fit System within the shoulder floaters. This Velcro-elastic system allows for precise customization of shoulder floater tension and fit to accommodate every goalie’s preference. Compared to the CCM Premier chest and arm unit, the Premier Pro will offer top quality protection and materials, designed to face advanced level shots in a package that is meant to last. For the goalie looking for the most advanced protection available on the market in a redefined classic design, the all-new CCM Premier Pro is the way to go.